Here’s an update to a program that we introduced to my ANG Main Line Stitchers group for a coffee cup canvas that we will all stitch and give to Starbucks as a thank you for letting us use their conference room for free. Come join us any second Monday of the month at 7 pm at 218 Lancaster Ave.
I’ve just stitched 3 more cups including the bottom right green cup. I wanted a full coverage because the canvas wasn’t painted correctly. So, I used alternating mosaic. I like adding a sparkle with Kreinik to that green. It’s odd that the handle is one of only 2 cups with a red handle. I stitched the other cup with the red handle in the upper right corner. For this cup and saucer and the white cup with red saucer near the bottom center, I tried 3 different wavy stitches that I found in Desert Island Stitches, Vol 1. These can be done vertically or horizontally. The wavy stitch in the grey cup was a little tricky but I like the look. Only 8 cups left to go and nearby backgrounds. This is a fun canvas to stitch! One program that we introduced to my ANG Main Line Stitchers group is a coffee cup canvas that we will all stitch and give to Starbucks as a thank you for letting us use their conference room for free. The store manager loved the canvas and was very pleased to know we wanted to do this for the store. Since September, we’ve been meeting there still the second Monday of the month at 7 pm but at 218 Lancaster Ave and love the better seating and lighting, the coffee, and treats! Come join us if you have the time. 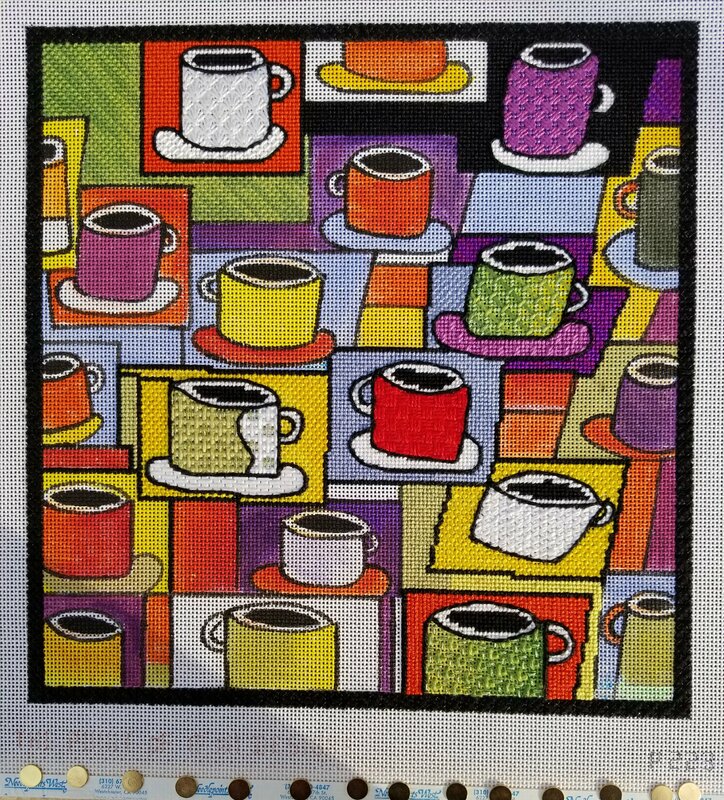 This design is from The Point of It All and is called “Coffee Cups”! We got it on sale at 45% off from the Seminar shop, Needlepoints West. It is a 13-mesh canvas with a design area of 12¼” x 12¼”. The chapter bought the threads. Linda, Buff, and I chose the threads – single strand Planet Earth silks and matching Kreinik for most of the piece. And, DMC #3 pearl is being couched with one strand of DMC 310 floss on all the curved outlines of the cups. We’re all taking turns passing around the piece stitching 2 cups each. Each person can use whatever stitches they like. I did write up some general guidelines for consistency across all the rims, handles, and coffee in cups. And, I offered some suggestions for a few open laid patterns to allow the canvas to show through some. Linda stitched the top left white cup/saucer, the top right purple/white cup/saucer, and corresponding backgrounds. I added the green one below Linda’s purple one. And, the green/white cup below Linda’s white one. I used an open pattern on the green one in order to allow the colors of the canvas to show through. Kathy stitched the red cup in the middle and the black border. Patrick stitched the white cup and green (another great open pattern) cup on the bottom right. Everyone is picking great stitches. Who’s next & what will they pick?